There are several versions of the popular story that develops in the community about the origins Reog and Warok. Below is one of them. According to the story, the birth of art Reog began in Saka 900, the background story of King Kelana Sewandana trip, King of the Kingdom Bantarangin who is looking for queen candidates. Together with horsemen they are faithful, Bujangganong. Finally he has found his idol, Dewi Sanggalangit (Princess Sanggalangit), daughter of Kadiri. But the princess set the condition that the prabu create a new art before she received the king's love. So that's where art is created Reog. Reog form was actually a satire whose meaning that the king (tiger head) have driven or heavily influenced by the queen (the peacock). Usually one reog group in the show consists of an old Warok, some young warok, pembarong, Bujang Ganong dancers, and King Kelono Suwandono. The numbers ranged from 20 to 30-person, a central role in the hands warok and pembarong. Origin of writing itself based of “Reyog”, the letter represents a first letter of words in the song macapat Pocung which reads: sense ballad / soul ingwang adiluhung / Yang Widhi / Yang kridaning Gusti / titles roll kersaning Kang Almighty. Replacement Reyog be Reog mentioned for "development purposes" - when it was polemical. Ponorogo regent Markum Singodimejo who sparked the name Reog (Resik, Endah, Omber, Girang gemirang) keep it as an official slogan of Ponorogo. The Reog story line is staging by Warok, then Jatilan, Bujangganong, Kelana Sewandana, and then Barongan or sudden Merak at the end. When one of the above elements in action other elements comes to move or dance, though they are not outstanding. Modern Reog usually performed in several events such as weddings, circumcisions and the great days of national. 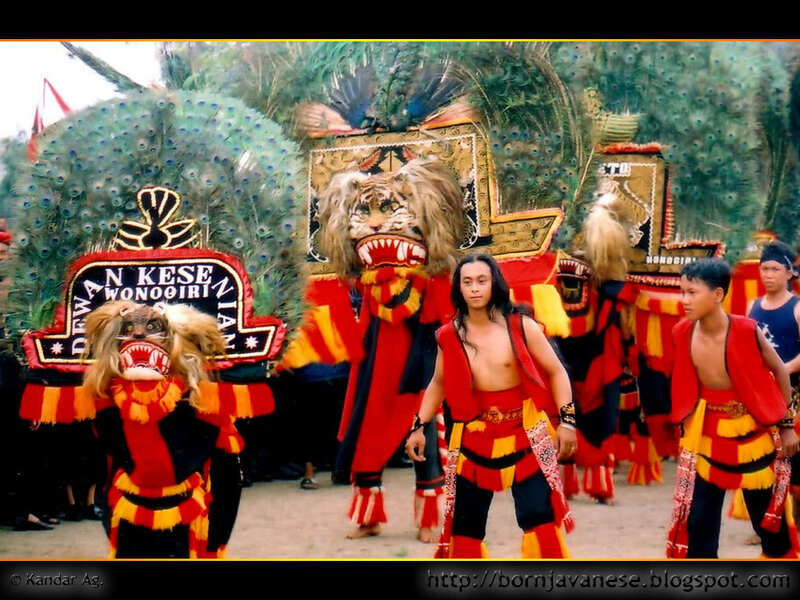 Art Reog Ponorogo series consists of 2 to 3 opening dance. The first dance is usually performed by 6-8 valiant men dressed all in black, with red polished face. The figure depicts the lion dancers are brave. Next is a dance performed by girls who ride horses 6-8. In the traditional Reog, dancers are usually performed by male dancers dressed in women. This dance is called the Jaran Kepang dance, which should be distinguished from other dances that Kuda Lumping dance. Other opening dance if there is usually a dance by a little boy who brought the funny scenes. After the opening dance is complete, the new core scenes whose content is displayed depends Reog condition where art is displayed. When it comes to marriage, the romance scenes are displayed. For the celebration of circumcision, is usually the story of warriors. Art scene in Reog usually does not follow a neat scenario. Here there is always interaction between players and masterminds (usually the leader of the party) and sometimes with the audience. Sometimes a player's performances can be replaced by another player when the player's fatigue. The first importance in the staging of art Reog is to give satisfaction to the audience. The final scene is a barong lion, where the actors wear masks shaped head of a lion with a crown made of peacock feathers. Weight mask can reach 50-60 kg. Heavy mask is carried by the dancers with his teeth. The ability to bring masks are obtained in addition to weight training, is also believed with spiritual exercises such as fasting and penance.